October 22, 2010 By This post may contain affiliate links. 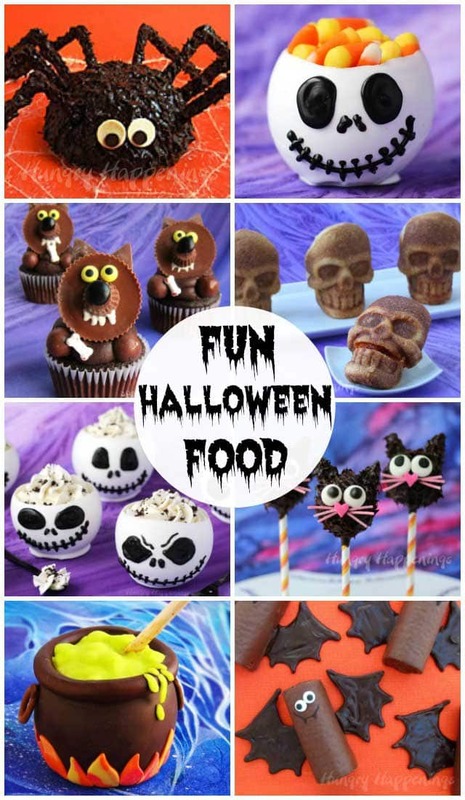 Make some of these Black Cat Truffle Pops for a fun Halloween treat! 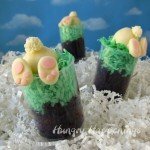 They have a purrfect amount of delicious chocolate in them, you wont be able to get enough! 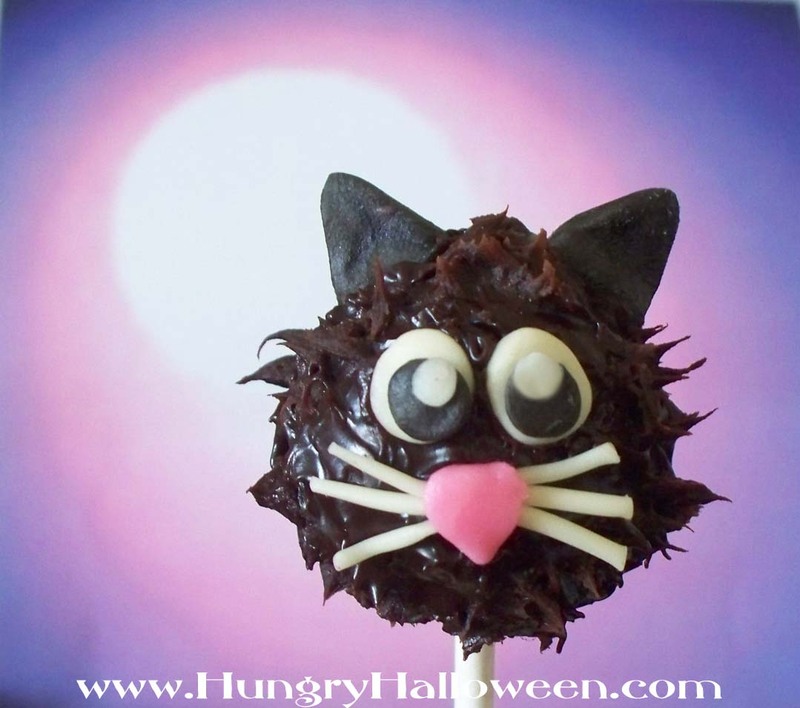 Bewitch your family and friends this Halloween with these adorable Black Cat Truffle Pops. Each little pop is a delicious chocolate truffle decorated to look like a charming Halloween cat. Homemade modeling chocolate is used to create the cat’s features, but you can use store bought fondant, if you prefer. 1.Pour semi-sweet chocolate into a medium sized shallow bowl. Heat heavy whipping cream in a small pot over medium high heat. Let mixture just come to a boil. Pour over chopped chocolate. Let sit for 3 minutes. Stir until creamy. Place a piece of plastic wrap directly on top of chocolate mixture (ganache). 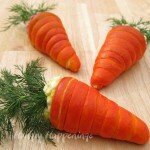 Let sit overnight or place in the refrigerator for 1-2 hours. 2.Meanwhile make the white modeling chocolate. Pour white chocolate into a microwave safe bowl. Heat for 30 seconds on high power. Remove and stir. Heat for 20 seconds then stir vigorously. If not melted, continue to heat at 10 second intervals, stirring in between each until melted. Allow chocolate to cool to 89-90 degrees. If you don’t have a thermometer, test the chocolate by placing a small amount on your lip. It should feel cool before you proceed to the next step. 3.Stir the light corn syrup into the melted chocolate. It will get thick quickly. 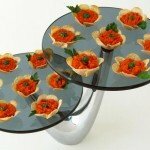 Pour onto a counter top (granite or marble are perfect for this job). Knead until smooth and glossy. If your modeling chocolate becomes oily due to the fact that your chocolate was too hot, you must continue to knead until it becomes smooth and glossy. Make sure your hands are cold or use a spatula to knead. If your modeling chocolate is dry, knead in a small amount of corn syrup. 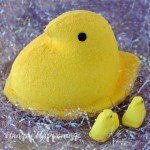 Wrap in plastic wrap until needed. 4.Once your semi-sweet chocolate ganache is very thick, scoop out 16 heaping tablespoons and roll each into a ball, reserving the remaining ganache. Set on a parchment paper lined baking sheet. Insert a lollipop stick into each ball. Place in the freezer for 15 minutes. 5.Once you remove the pops from the freezer, re-heat the remaining ganache in the microwave for 3 second intervals, stirring in between each, until ganache is thin and glossy. Don’t over-heat or the ganache will become oily. Reshape the pops into nicely round balls. Holding a stick, dip a pop into the thinned ganache. Remove and shake gently to remove any excess ganache. Immediately, use a knife or spatula to make the cat’s hair. 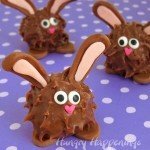 Press the spatula into the ganache and pull away creating spikes of fur. Continue all around the cat’s head. Push the stick into a piece of Styrofoam and allow the pop to dry or you may lay them on parchment paper, but the back of the cat’s head will flatten out. Repeat with remaining pops. 6.To decorate the cats: Pinch off very small pieces of white modeling chocolate and roll into balls. Press onto the cat’s face to create eyes. Pinch off about a tablespoon of modeling chocolate and add a few drops of black food coloring. (I suggest you wear food handling gloves for this task.) Pinch off very small pieces of black and roll into balls. Press onto the white eyes on the cat’s face. Pinch off tiny pieces of white and roll into balls. Attach to the black on the eyes. 7.Pinch off small pieces of white modeling chocolate and roll into very thin logs. Cut three short logs to fit on the cat’s face and attach under the eyes for it’s whiskers. 8.Add some pink food coloring to about a teaspoon of white modeling chocolate. Pinch off small pieces, roll into balls, then shape into little cat noses. Attach to the cat’s face over the whiskers. 9.Pinch off small pieces of black modeling chocolate and roll into balls. Pinch into triangles and add to the cat’s head for ears. 10.Allow cat pops to dry. Once the ganache hardens, you can package the cat pops in cellophane bags. Cat pops will keep at room temperature for 10 days. Use any excess ganache for ice cream topping or to make some truffles. Create little ghosts or pumpkins out of any remaining modeling chocolate. 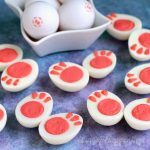 I just ran across your adorable cat cake pops recipe, and I think it would be a perfect feature for our craft site, CraftFoxes.com. 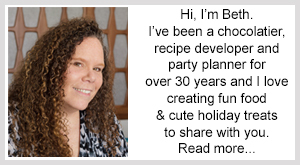 Would you allow us permission to reprint the recipe as a how-to, with a link back to your site? Please let me know–we'd love to feature it in time for Halloween!